Dives, Turns & Speed Development. 2 Day camp at Abingdon School. This two-day camp will offer technique corrections, demonstrations, and a training session to implement your new techniques. There will also be land training and informative talks including Q&A. Limited to 3 swimmers per lane. Covering all four stroke over the two days. This two-day camp will offer live demonstrations and technical guidance. Each day will also include land training sessions, workshops and Q&A. Limited to 3 swimmers per lane! Great Price at £77 Each Day. Aimed at competitive club swimmers striving for county qualification and above, aged 10-16. 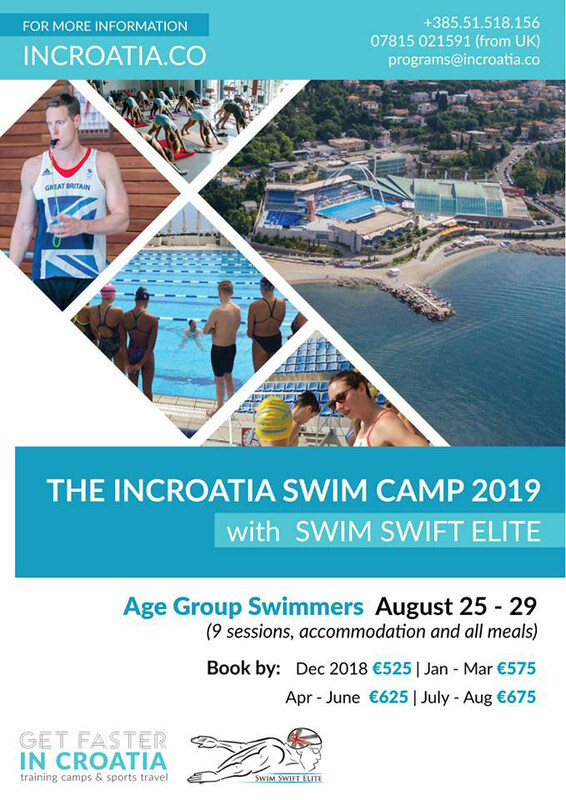 The INCroatia Swim Camp marches on into the fourth year, applications now open for Youth Swimmers! Standard procedure: The sooner you book, the less you pay. Check out videos from previous years and apply! Join us if you aspire to be the best! Throughout the year, our various camps will allow you to perfect your stroke techniques, improve your starts & turns, work on your race tactics, and much more. Keep an eye out for camps covering specific skills & strokes you would like to improve! Using modern land training techniques, core & flexibility training in an environment focused towards excellence at our fantastic facilities. As Olympians, we know what it takes to reach the pinnacle of our sport and we are keen to pass on this knowledge to you. Motivational speeches, nutritional advice, racing psychology plus other talks and Q&A will be delivered. All aimed to inspire and give you that Olympic experience. What age did you start swimming? Joe: I began swimming around 6 yrs old at learn to swim classes. Amy: I was still scared of water aged 7 so it was after this my parents decided I should have swimming lessons to be safe. Joe: Holding a Commonwealth record and qualifying for the Olympic Games. Amy: Making it to the Olympics had always been something that I dreamed of, but when I was younger I never expected to get there. Competing at the Olympic Games was definitely one of my biggest sporting achievements. Alongside this, my international individual bronze medal in the 100m Freestyle at the European short course championships in 2011 was a massive achievement for me. Biggest influences in your career? Joe: My parents, would have been impossible to do without their support at a young age. As a senior my coach Ian Armiger at Loughborough Uni. Amy: My parents were also a fantastic influence on my career. They wanted me to do something I loved and never pushed me more than I wanted to be pushed, but were supportive with whatever decisions I made in my career. I couldn’t have done it without them. Amy: When I was young I enjoyed watching Alison Sheppard MBE swim. She was a British and Scottish swimmer that went to 5 Olympic Games and swam the events that I swam. More recently, I think Natalie Coughlin is a great role model. She is an American swimmer who had won 12 Olympic Medals, and at the age of 32 she obviously loves swimming. She does everything right and is very professional, and reaps the rewards for it. What size are your feet? Amy: Not usually one that female swimmers get asked so much, but I am a size 8. What other sports are you interested in? Joe: I enjoyed tennis and athletics when growing up. Now an avid MMA (Mixed Martial Arts) fan. Amy: I don’t religiously follow any other sport, but I love watching most other sports. Especially athletics and gymnastics. What was your first swimming club? Amy: Kidderminster Swimming Club, which later merged with Stourport Swimming Club to form what is still known as Wyre Forest Swimming Club. What is your favorite event? Amy: My favourite event tends to change, and it can depend on how well I am doing at it at the time! Most of the way through my career, my favourite events have been the 50m and 100m freestyle, although I always thought the 200m freestyle was a brilliant event to watch with all of the pacing and tactics involved, and I always wished I was better at it. Towards the end of my career I enjoyed having a change, and the 50m butterfly became my most enjoyable event.